Video clip synopsis – The indigenous art of Africa, the Americas and Oceania inspired European artists such as Jacob Epstein and Max Ernst, who in turn were an inspiration for Australian painter Albert Tucker. Broadband MP4 hidden3_bb.mp4 (17.4MB), suitable for iPods and computer downloads. 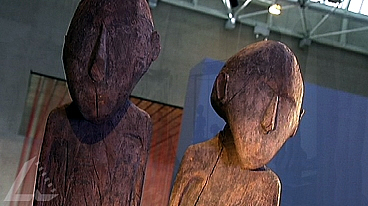 Max Ernst Collection & Lake Sentani Figures is an episode of the series Hidden Treasures (15 × 5 mins) produced in 2006. What kind of art does an artist collect? At the National Gallery of Australia is part of a collection once owned by European surrealist artist Max Ernst. An eclectic collection of masks and carvings from Africa and the Americas, it’s a fascinating glimpse of Ernst’s personal passions and preoccupations as an artist. Like other surrealists, Ernst felt himself to be at the tail end of a European tradition that had for centuries been dedicated to visual realism. To his eyes, the indigenous artists he collected had by birthright what the surrealists longed for: access to human instincts that lie buried under the layers of inhibitions and societal taboos of European civilisation. American-born British sculptor Jacob Epstein was also an avid collector. Amongst his collection were a series of imposing figures, probably from the 18th century. Dredged up from the bottom of Lake Sentani in West Papua in 1929, they once would have formed the post of a house built over its water. Now they’re part of the National Gallery’s collection. In Australia, it was the European surrealists who most inspired a group of young artists in Melbourne as they responded in their work to the trauma of the Second World War. Among them was Albert Tucker who was appalled by the licentious behaviour he saw in the blacked-out city streets. In the gallery’s collection is his Image of Modern Evil 24, with its brilliant red crescent a symbol of female depravity. Its watcher on a balcony is as weird and inventive as anything the European surrealists came up with, but the setting—a cast-iron balcony—makes it unmistakably Australian. Research the life of Max Ernst and discuss how influences from his collection of figures and masks and other sources can be seen in his artwork. Albert Tucker was one of the artists known as the Angry Penguins. Who were some of other artists in this group and what were the characteristics of their artwork? What do the images by Max Ernst, Jacob Epstein and Albert Tucker have in common? Select paintings from each of Ernst, Epstein and Tucker. Choose symbols from the paintings and suggest possible meanings for each. Drawing on the works of Ernst, Epstein and Tucker for inspiration, create a surrealist still life from magazine collage. Using a grid enlargement, reproduce the still life image then render the collage in ink and coloured pencils or with water-soluble pencils. Create surrealist portraits or objects by combining various images inside a shape or outline that represents its inner workings. Ensure there is a focal point and show awareness of positive and negative space. You may use digital photographic portraits and appropriate graphics software for this activity. Document the process, noting your use of past skills and the new skills you have acquired.